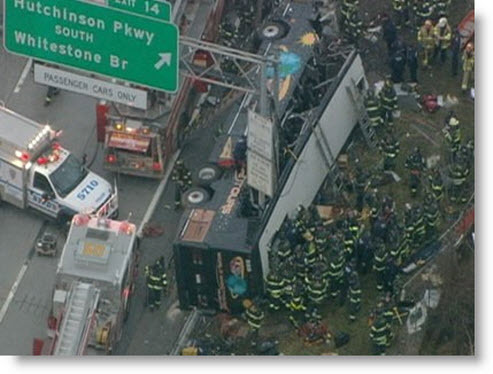 First there was last week’s tour bus accident in the Bronx, killing 13. The driver of the bus allegedly fell asleep at the wheel and the tour company, World Wide Tour, has been cited five times over the past two years for fatigued driving. Last night perhaps an MTA M15 bus driver should be cited for driving while blind. He plowed into a food delivery person and crushed his head under the back wheel, claiming he didn’t even see him. A delivery bicyclist was killed by a city bus today after the two collided on the Upper East Side, authorities said. The rider was heading eastbound on East 96th Street when he was fatally struck by an M15 bus traveling south on Second Avenue at 4:10 p.m., according to witnesses. The victim was hit by the front of the bus, slid underneath the vehicle and, then, had his head crushed by a rear tire, witnesses added. The bus driver kept going, apparently unaware he had struck someone. Transportation officials and cops are still seeking the bus, said an MTA spokesman. It’s so hard to see cyclists, especially when it’s 4:15pm in the afternoon.